MONROVIA, Liberia -- Dozens of people quarantined for Ebola monitoring in western Liberia are threatening to break out of isolation because they have no food, the West African nation's state radio reported Thursday. Forty-three people were put in quarantine after four people died of Ebola in Jenewonda, a town in an impoverished corner of Grand Cape Mount County near the Sierra Leone border, the Liberia Broadcasting System said. It quoted those quarantined as saying that the U.N. World Food Program apparently has stopped providing food to people affected by Ebola in the area. But a World Food Program spokesman said they hadn't been distributing food there. "WFP in Liberia heard about this community being isolated only two days ago via the radio and staff immediately began organizing a mission to bring food to the quarantined people," said spokesman Alexis Masciarelli in an email to The Associated Press. The WFP logistics unit is delivering food to that community Thursday, he said. There are no trucks in Grand Cape Mount County so food needs to be driven in from Monrovia, he said, adding they will verify reports with authorities and look into what is going on. "We need to keep working with government and partners to identify the communities in need as quickly as possible," he said. 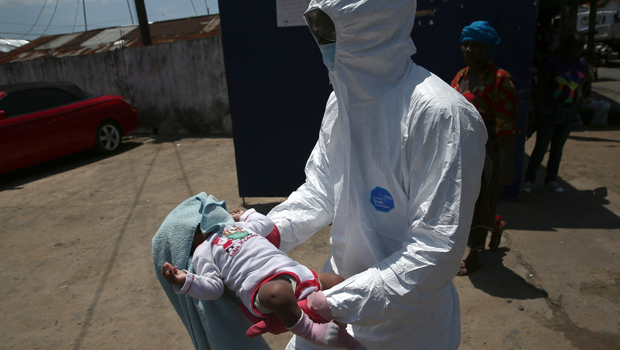 Liberia is the hardest hit of three West African nations being ravaged by Ebola. The latest figures published Wednesday by the U.N. World Health Organization show the country has at least 4,665 infected people and 2,705 have died there. WHO says there probably are more ill people and deaths but the numbers are under-reported. Overall, the WHO says the disease has killed 4,877 people and infected 9,936, almost all in Liberia, Guinea and Sierra Leone. The fear of Ebola in Guinea has kept patients and health workers, including doctors, from a hospital that is serving as an Ebola center in the capital, Conakry. "People are talking about Ebola all over here, they say 'If you come here at the hospital you will get this and that,'" said Abdulai Sie Sawaneh a merchant living and working at the Donka hospital compound. "The public is now afraid of the hospital and nobody is coming." Earlier this month, President Alpha Conde called on retired doctors to join the fight against Ebola. M'balia Camara who sells food at the hospital said she has lost customers because of the fears. "At this time there is no business, people have run away from the hospital because even if you have a headache they will say you have Ebola and they will inject you to die," she said. "Patients, doctors and visitors used to buy my rice, but as am talking to you, all the hospital wards has been emptied." Mamadou Cherif Diallo, who traveled about 43 miles to visit his grandmother at the hospital said the way people are talking about Ebola is generating panic. "That is why I am afraid and I don't believe anybody except God Almighty, this is what I know," he said. In Freetown, the Sierra Leone capital, the head of the U.N. Mission for Ebola Emergency Response, Anthony Banbury, told a news conference Thursday that "We are working to put this fire under control." They would start by trying to isolate at least 70 percent of cases, he said. The U.N. plan to stop transmission also includes safely burying at least 70 percent of victims by Dec. 1, and to have 100 percent of cases isolated and all the dead safely buried by Jan. 1. An internal U.N. World Health Organization report obtained by The Associated Press blames a series of blunders for allowing the epidemic to spiral out of control, notably the organization's own "failure to see that conditions for explosive spread were present right at the start." Banbury said, "The World has never seen a serious, grave and complex crisis of this nature where people are dying every day with unsafe burial practices." Among needs he identified were efficient contact tracing, safe burials, social mobilization and involvement of communities, bringing treatment centers closer to communities and ensuring that the centers are supported by robust logistics and training. "A lot of work needs to be done and no one country can do it alone," he said. Rwanda's minister of health, meanwhile, is reversing a decision she made to require visitors who had been in the U.S. or Spain during the previous 22 days to report their medical condition to Rwandan authorities daily. Dr. Agnes Binagwaho said on Twitter late Wednesday that the decision to screen travelers from the U.S. and Spain, two countries that have seen cases of Ebola, was solely her decision and not the government's. She apologized for any inconvenience. No Ebola cases have been reported in Rwanda. The U.S. Embassy said that Rwanda is not allowing visitors who have recently traveled to Guinea, Liberia, Senegal, or Sierra Leone.